Irene Agnes Kegler, 96, of Winsted, died Monday, Aug. 8, 2016, at The Garden House Assisted Living. A Mass of Christian Burial was held Thursday, Aug. 11, at Holy Trinity Catholic Church in Winsted with the Rev. Paul Schumacher as the celebrant. Casket bearers were Thomas Vacek, John Vacek, Kyle Kulinski, Daniel Lhotka, Travis Kegler and Connor Larson. Interment was in the Holy Trinity Cemetery in Winsted. Irene Kegler was born Dec. 23, 1919, in Silver Lake, the daughter of John and Gertrude (Wosmek) Schultz. She attended Country School 27 and graduated from Silver Lake High School in 1937. On Sept. 16, 1941, Irene A. Schultz and Leonard B. Kegler were joined in holy marriage at St. Joseph Catholic Church in Silver Lake. God blessed their marriage with six children. The couple engaged in dairy farming for several years three miles south of Winsted. Mrs. Kegler later worked for Edco Products in Winsted as a seamstress for 34 years. 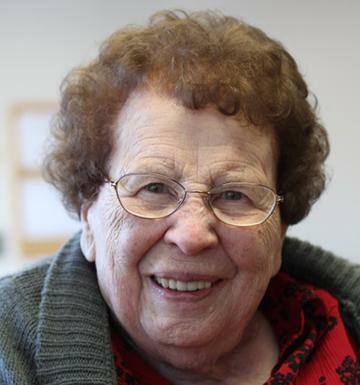 At the age of 84, she took the job as site manager for Winsted Senior Dining. She retired shortly before her 90th birthday. Mrs. Kegler enjoyed playing cards, traveling with her friends and getting together with her family. She had a great sense of humor and a deep faith in God. She also was a volunteer at St. Mary’s for many years. She was a faithful member of Holy Trinity Catholic Church and the St. Anne’s Society. She held offices in the Council of Catholic Women, American Legion Auxiliary Post 407 and VFW Auxiliary Post 9232. She is survived by her daughters and a son, Marion (Donald) Lhotka of Lester Prairie, Harlen (Gayle) Kegler of Winsted and Bonnie (Lannie) Grages of Glencoe; sons-in-law, Joseph Vacek of Hutchinson and Jim Kulinski of Lester Prairie; grandchildren, Tom (Deb) Vacek, Mary Vacek, John (Denise) Vacek, Lisa (Brian) Felder, Lynn (Kevin) Peterson, Daniel (Katie) Lhotka, Jodi (Jeff) Menke, Julie (Eric) Olson, Jill (Greg) Graczyk, Travis Kegler, Melissa (Gerard) O’Halloran, Kyle (Tara) Kulinski and Kristin (Jason) Witts; 24 great-grandchildren; a sister, Adeline Graczyk of Foley; many other relatives and friends. She was preceded in death by her husband, Leonard B. Kegler in 1979; daughters, Roxanne Kegler in 1961, Janet Vacek in 2011 and Marlene Kulinski in 2015; brothers, John Schultz Jr. and Edward Schultz; sisters, Agnes Kegler and Margaret Pichotta; brothers-in-law, David Pichotta, Ben Graczyk and Felix Kegler; and sisters-in-law, Marie Grzeskowiak and Helen Laxen. Arrangements were with the Chilson Funeral Home in Winsted. Online condolences may be made at www.chilsonfuneralhome.com.